Grave of the Fireflies is a 1988 Japanese animated drama film written and directed by Isao Takahata and animated by Studio Ghibli. It is based on the 1967 semi-autobiographical short story Grave of the Fireflies by Akiyuki Nosaka. The film stars Tsutomu Tatsumi, Ayano Shiraishi, Yoshiko Shinohara and Akemi Yamaguchi. Set in the city of Kobe, Japan, the film tells the story of two siblings, Seita and Setsuko, and their desperate struggle to survive during the final months of the Second World War. Grave of the Fireflies received acclaim from film critics. Roger Ebert of the Chicago Sun-Times considered it to be one of the best and most powerful war films and, in 2000, included it on his "Great Movies" list. 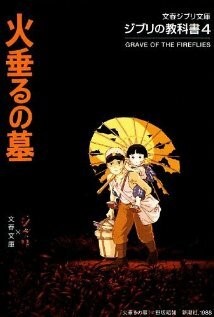 Two live-action remakes of Grave of the Fireflies were made, one in 2005 and one in 2008. It is commonly described as an anti-war film, but this interpretation has been challenged by the director and some critics.